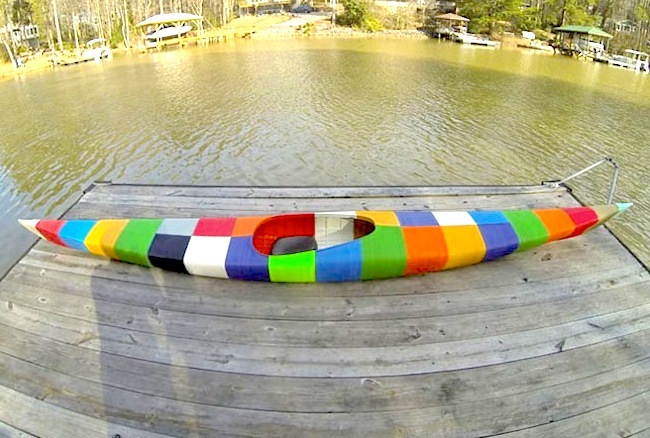 An engineer for leading 3D printer manufacturer 3D Systems, Jim Smith decided to build his own large scale 3D printer at home and then used it to produce the world’s first 3D-printed kayak. To print the kayak, which is made with 58 pounds of ABS plastic, he had to modify the 3D printer to print the parts inside a heated chamber so they wouldn’t warp or crack. The colorful result maintains its crucial shape and works like a charm. The kayak is composed of 28 sections. Each section is equipped with brass threaded thermoplastic inserts so that the next corresponding section can be screwed into it. To make the boat water tight, silicone caulk is used between the sections. It features a 6mm thick hull with a built-in, internal rib structure that provides strength yet keeps the kayak lightweight. On the bow and stern, Smith attached plug in points for cameras, handles and other add-ons. 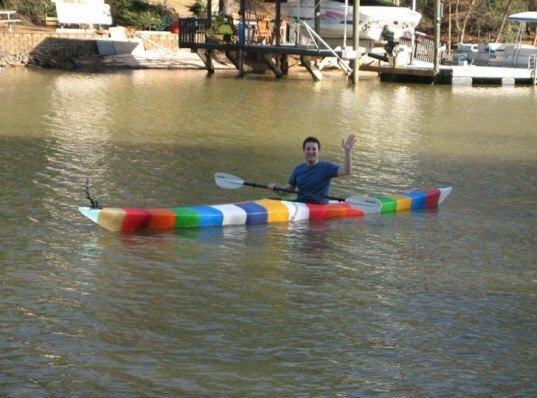 The kayak is 16 feet and 8 inches long, cost just $500 to make, and it floats! Smith has kayaked around with it to prove it. Check out his website Grass Roots Engineering for more details about this and other 3D-printing exploits. An engineer for leading 3D printer manufacturer 3D Systems, Jim Smith decided to build his own large scale 3D printer at home and then used it to produce the world's first 3D-printed kayak. To print the kayak, which is made with 58 pounds of ABS plastic, he had to modify the 3D printer to print the parts inside a heated chamber so they wouldn't warp or crack. The colorful result maintains its crucial shape and works like a charm.